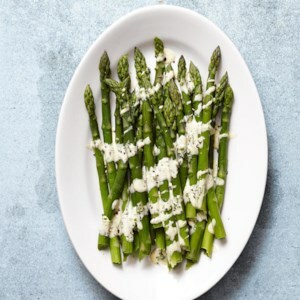 Find healthy, delicious steamed asparagus recipes, from the food and nutrition experts at EatingWell. 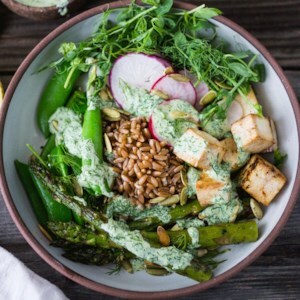 This healthy grain bowl packs in the greens with peas, asparagus and a creamy yogurt dressing. Tofu adds protein while keeping it vegetarian, but you could also swap in cooked shrimp or chicken for a satisfying dinner or packable lunch ready in just 15 minutes. 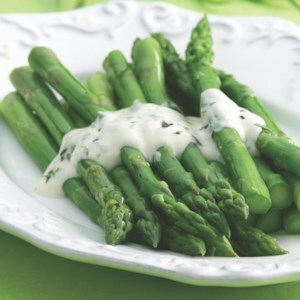 This simple blender hollandaise recipe with fresh herbs makes a luscious topping for steamed asparagus, but is also great with artichokes, fish and, of course, eggs Benedict. 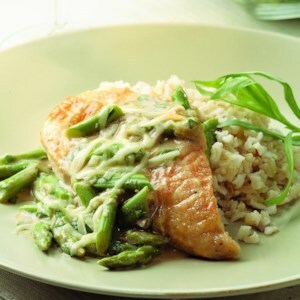 For a nutty flavor, try browning the butter before adding it to the blender, and/or top the asparagus with slivered almonds or chopped pecans. This sauce is like a luscious, creamy béarnaise sauce without all the calories and fat. Think bold Caesar-salad flavors meet asparagus. This preparation will kick you in the taste buds with assertive garlic, spicy red pepper and rich, salty anchovy. 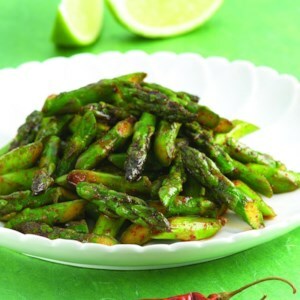 Earthy chili powder combines with the sour-power of sherry vinegar to create a fine dressing for the grassy-green asparagus. For a smoky twist, try substituting smoked paprika for the chili powder. 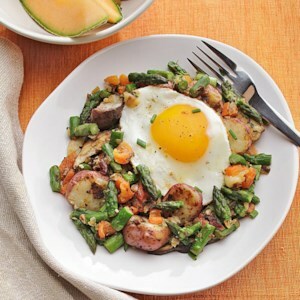 Made with asparagus, roasted red pepper and mushrooms, this hash has a fresh and light, springtime taste. 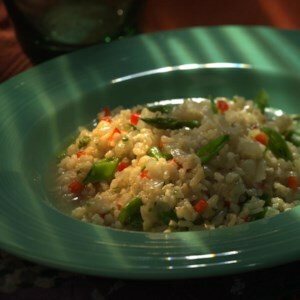 Serve with hearty whole-grain toast for an easy vegan breakfast or with an egg on top for a vegetarian take. 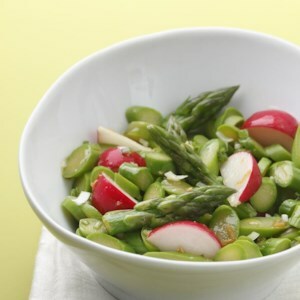 This colorful asparagus and radish salad is dressed with a sesame-soy vinaigrette. Pair it with grilled shrimp and rice noodles. 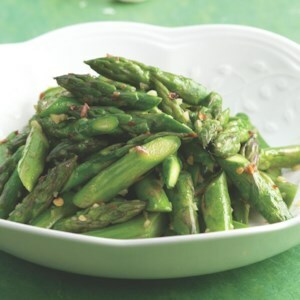 This quick raw “tomato sauce” makes a beautiful, elegant topping for asparagus spears. 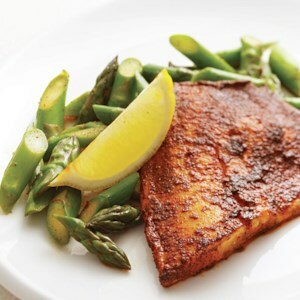 This is a great dish for entertaining because it will be just as delicious warm or room temperature. Tilapia, a relatively plentiful fish, has the unfortunate reputation of being dull. All it needs is a spice rub, a familiar barbecuing technique that works just as well indoors. You could also use this rub on chicken breasts or toss it with lightly oiled shrimp before cooking. 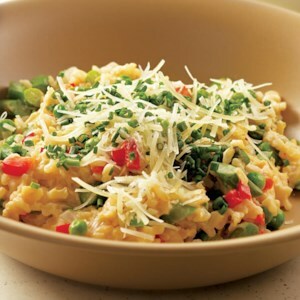 The nutty flavor and toothsome texture of barley make it a ideal complement for Parmesan cheese in this risotto-style dish. 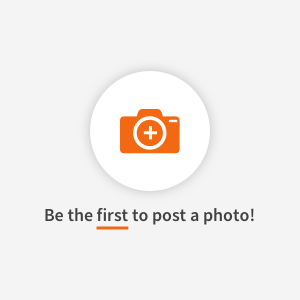 Be sure to use the convenient quick-cooking barley, which is available in most supermarkets, rather than regular barley, which takes much longer to cook.